NEWPORT BEACH, Calif., Feb. 11, 2019 /PRNewswire/ -- Chipotle Mexican Grill (NYSE: CMG) today announced the launch of Behind the Foil, the most intimate look into the company's operations in its 25-year history. 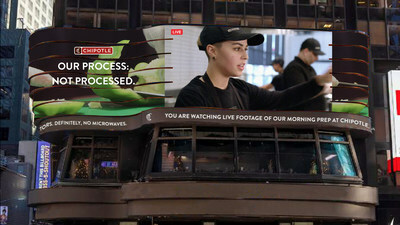 The documentary-style digital and TV spots, shot by famed documentarian Errol Morris, aim to "pull back the foil" by featuring behind-the-scenes footage of Chipotle restaurants including Chipotle's kitchens, equipment and prep routines, and featuring Chipotle employees and the farming partners that fuel the brand's real ingredients. The campaign content, created by Venables Bell and Partners, provides unfiltered and emotional testimonials from Chipotle team members about the impact Chipotle has had on their lives, as well as a glimpse into the daily preparation of Chipotle's fresh ingredients. Also featured are Chipotle's farming partners, providing a transparent look at how they harvest and supply the brand's real ingredients. To further illustrate its commitment to transparency, Chipotle will broadcast its morning food prep live from the Woodbury Town Center restaurant in Irvine, CA today from 11:30AM-1:30PM ET/8:30-10:30AM PT on its Facebook page, so anyone can tune-in and go 'behind the line' to better understand how Chipotle sources and prepares all its real ingredients each day. "Chipotle is committed to becoming a more culturally relevant and engaging brand, and Behind the Foil is another milestone along this journey," said Chris Brandt, chief marketing officer at Chipotle. "The campaign celebrates the heart of Chipotle, our dedicated employees and our supply partners who grow the real ingredients that make up the delicious food that our fans love." Chipotle has always believed that there is a connection between how food is raised and prepared to how it tastes. These principles result in real flavors and real ingredients that are responsibly sourced and freshly prepared in Chipotle kitchens. Behind the Foil is an engaging opportunity for fans to see Chipotle's commitment to real ingredients and kitchen transparency come to life. "I've seen firsthand the real ingredients and culinary skills that Chipotle employees possess and I'm officially a believer," said Errol Morris. "What really sets Chipotle apart is the high standards we're held to when preparing and serving our food," said Bre Peterson, Chipotle employee from Massillon, Ohio who also appears in the new campaign. "I'm truly proud of the food we make every day and I've learned so much about cooking and food preparation during my time with Chipotle." Chipotle Mexican Grill, Inc. (NYSE: CMG) is cultivating a better world by serving responsibly sourced, classically-cooked, real food with wholesome ingredients without artificial colors, flavors or preservatives. Chipotle had nearly 2,500 restaurants as of December 31, 2018 in the United States, Canada, the United Kingdom, France and Germany and is the only restaurant company of its size that owns and operates all its restaurants. With more than 70,000 employees passionate about providing a great guest experience, Chipotle is a longtime leader and innovator in the food industry. Chipotle is committed to making its food more accessible to everyone while continuing to be a brand with a demonstrated purpose as it leads the way in digital, technology and sustainable business practices. Steve Ells, founder and executive chairman, first opened Chipotle with a single restaurant in Denver, Colorado in 1993. For more information or to place an order online, visit WWW.CHIPOTLE.COM.